Our emphasis is patient service to achieve best quality. We take time to explain and educate the patients so they could have the best care possible. We strive to have a reputation of excellent service. With recent developments in orthodontics, which include self-ligation braces, three-dimensional (3-D) imaging, orthodontic temporary anchorage devices (TADs), laser, the complexity has increased significantly for choices of orthodontic treatments that yield most efficacy (effectiveness). The biomechanics employed is continually and carefully evaluated for each patient because patients come with different conditions. Our philosophy is to use light forces for physiologic consideration such that teeth move at optimum speed with minimum discomfort to the patient. If discomfort is unavoidable, it would be reduced to the lowest level. The progression of the arch wires are carefully selected to ensure the patient would experience minimum discomfort. Some misconception exists regarding the necessary force applied and teeth movement. Some people thought using heavier force would make teeth move faster. In fact, the force that is compatible with physiologic condition is very light. Any heavier force would cause injury to the tissues which then require time for healing. The treatment time ends up to be longer. In addition, heavier forcces increase risk of root resorption (root becomes shorter), cause teeth to tip, and exacerbate periodontal disease. Braces consist of two components: brackets and archwire. 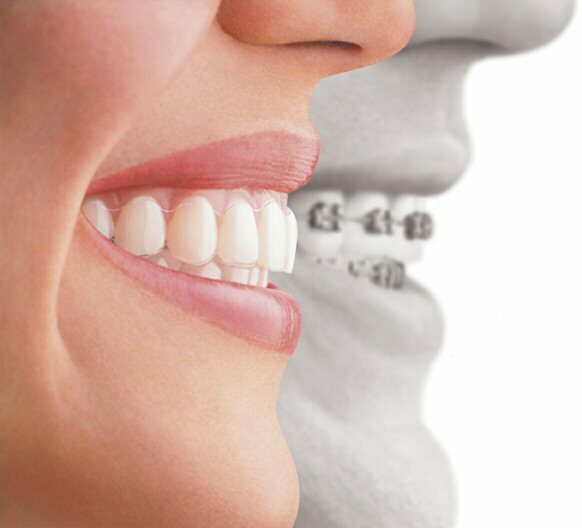 Braces mainly consist of two types: metal braces and clear braces. Each type can be non self-ligation or self-ligation. Metal braces (non self-ilgation) require elastic ties (or color ties) to tie the archwire to the brackets. Color ties are often preferred by some children, teenagers, and young adults. This is an advantage because they can use the color of the "color ties" to coordinate with the colors of their clothes and other jewleries. Some treat their braces like their jewlery. Some orthodontists dislike elastic ties because they think high friction associated with elatic ties would impede the teeth movement. In an effort to reduce the friction, some orthodontists use stainless steel (SS) ligature to tie (ligate) the archwire to the brackets (or they would prefer to use self-ligation brackets). But, the end of the SS ligature often gets undone and causes severe irritation to the patient's cheek or lip or both. Low friction can be a bless or a curse because the archwire with low friction can slide easily (if it does not have a stop) and pokes the patient's cheek. Consequently, emergency visit to the orthodontist's office would become necessary. Some adults prefer esthetic/ceramic braces to avoid being called "metal mouth." Esthetic archwires. Esthetic archwires are also called tooth-color archwires, but some tooth-color archwires are white and look attractive whereas others are yellow and look unappealing. Esthetic archwires are relatively more expensive. Figure 4 shows an example of a real esthetic archwire. Unlike some yellow tooth-color archwires, this one is white, so its look is more pleasing. The coating of the tooth-color archwires with poor quality could flake off. To solve this coating problem, an orthodontic company (Forestadent) came up with an esthetic archwire that has a very thin white tubing enclosing the metal wire. Ceramic braces also require elastic ties to tie the archwire to the brackets. The natural choice for "color ties" is the clear type. Unfortunately, this "clear" elastic ties will turn yellow after a color food or drink, causing an unsightly appearance. Other alternatives for less staining are "pearl", "smoke," etc. Many people prefer the appearance of monocrystalline for ceramic braces (Fig. 3). A typical ceramic bracket of less attractive look is of polycrystalline. A description of monocrystalline is given from http://en.wikipedia.org/wiki/Monocrystalline: "A single crystal or monocrystalline solid is a material in which the crystal lattice of the entire sample is continuous and unbroken to the edges of the sample, with no grain boundaries. The absence of the defects associated with grain boundaries can give monocrystals unique properties, particularly mechanical, optical and electrical, which can also be anisotropic, depending on the type of crystallographic structure. These properties, in addition to make them precious in some gems, are industrially exploited in technological applications, especially in optics and electronics." A description of polycrystalline is given from http://en.wikipedia.org/wiki/Polycrystal:"Polycrystalline materials are solids that are composed of many crystallites of varying size and orientation. The variation in direction can be random (called random texture) or directed, possibly due to growth and processing conditions." For normal bite or deep bite, ceramic bracket should only be placed on the upper arch. The reason is ceramic is an extremely hard substance, so if ceramic brackets are placed in the lower arch, then they will abrade the upper teeth. For most people, only the upper teeth are shown when they smile, so having the metal brackets on the lower teeth is not an esthetic problem. Conventional ceramic brackets have even higher friction than the conventional metal brackets because typical archwire is metal, and metal-to-ceramic contact has higher friction than metal-to-metal contact. Thus, treatment time with conventional ceramic brackets are typically longer comparing to conventional metal brackets. Unlike conventional metal braces, self-ligation braces have less friction. Some studies have shown that self-ligating brackets significantly lower frictional forces. But less friction could be a bless or a curse. The bless is less friction may result in more efficacy in teeth movement, whereas the curse is less friction often causes the archwire to slide and poke the patient's cheek. Hence, more emergency visits are required. Of course, one can to stop the unwanted sliding by using a few different techniques. It is not a true claim that self-ligation braces decrease the number of appointments and shorten treatment time. Another untrue claim is self-ligation braces can eliminate the need of teeth removal for crowded cases (that would require teeth removal with ttraditional braces or non-selfligation braces). Self-ligation brackets are inherently thick, whereas the traditional twin brackets could be made thinner (or lower profile). The thinner the bracket is, the more comfortable the patient would experience. Self-ligation braces may be faster for the teeth to be leveled and aligned but may be more inconvenient for obtaining the perfect teeth positions at the end. Similar to traditional braces, self-ligation braces also consist of two types: self-ligation metal braces and self-ligation ceramic braces. Self-ligation Metal Braces: SPEED. For this type of braces (Fig. 4), 0.016" NiTi Supercable is often used as the first archwire (for relatively crowded case and when the braces were first placed). This special archwire (uniquely designed by Strite Limited for SPEED braces) exerts the lightest force possible (and practical) to minimize the pain or discomfort that some patients might experience. After that, the progression of the archwires will be carefully selected to ensure the patient would experience no pain nor discomfort. Self-ligation Ceramic Braces: In-Ovation® C. This type of bracket (Fig. 6) attempts to combine the two features (self-ligation and esthetic) in one design, but the metal gate is visible such that the esthetics is compromised. Invisalign (Fig. 7) uses a series of clear aligners that are custom-molded to fit the patient's dentition. The less visible aligners gradually reposition the teeth. Invisalign is not for everyone. Some people prefer to call Invisalign as "less-visible braces." Invisalign has certain advantages and disadvantages (pro's and con's.) The major disadvantages of Invisalign include the following difficulties: fixing rotated teeth, closing large gaps, and finishing the case to ideal look and bite. After removal of braces, everybody must wear retainers. Esthetic retainers are as important as esthetic braces. A ideal esthetic retainer looks good and functions well. A standard Hawley retainer (Fig. 8) functions very well, but it is not considered esthetic. An esthetic retainer, shown in Fig. 9, is attractive and has good function. This retainer can be designed like a Hawley retainer but has a much more appealing look. There are other types of clear retainers such as Essix and Vivera (of Invisalign), which may look good but have occlusal problem for long term use. Phase I is for children (typically around 7-9 years old) with mixed dentition, meaning with mixed "baby" teeth and permanent teeth. Baby teeth or "milk" teeth are layman terms whereas primary teeth and deciduous teeth are the technical terms. Deciduous is considered a more correct term by many dentists. Permanent teeth is alsc called adult teeth. Phase I may eliminate the need for Phase II or reduce the severity of the dental problem in Phase II (if Phase II becomes necessary). Treatment time for Phase I is approximatelly 12-18 months which allows the necessary corrections to be made. If this treatment time becomes longer, patients and parents often get burnt out and discouraged (for a later Phase II). Phase II is for children (typically around 12 years old, give and take) who have gone through Phase I previously, and it is best when only one or two deciduous molars remain. If braces are started at this particular time, advantage of leeway spaces can be utilized such that crowding problem can be resolved easier or without harmful side effects. There is often a break time between Phase I and Phase II. How long is the break time? If Phase I is delayed, then this break time becomes shorter. Ideally, the second molars must also be fixed if they are malaligned at the end of Phase II. The combined treatment time and cost of Phase I and Phase II will certainly exceed those of single-phase treatment, but so will the quality of the results. The reason is the results would be more stable, meaning relapse will less likely to occur. It is important to inform/educate the patients and their parents the advantages of intercepting growth-and-development problems and avoiding treatment as an adult. Full (phase) is either for people with all adult teeth or for those with one or two "baby" teeth left so that would be equivalent with combining Phase I and Phase II into a single phase. The second molars must be fixed if they are malaligned.